The massive 70′ x 76′ tunnel vent building wall on the Rose Kennedy Greenway has once again rotated contemporary murals with its fourth edition unveiled this week. 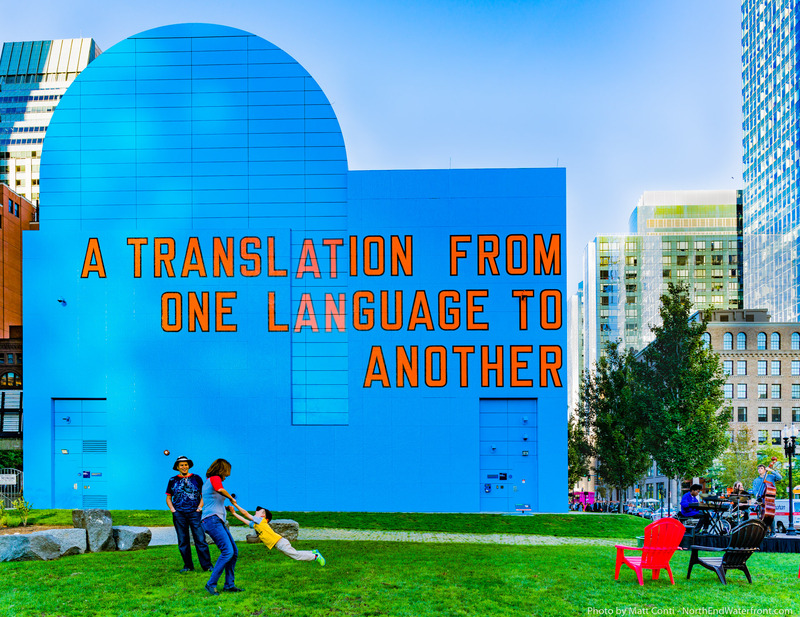 Created by Lawrence Weiner, the textual mural is simple and bright, with seven words in orange against a blue background, A TRANSLATION FROM ONE LANGUAGE TO ANOTHER. Artist Weiner is a Guggenheim fellow who is world-renowned for his work with language and words. The public art piece was commissioned by MIT’s List Visual Arts Center along with the Greenway Conservancy. 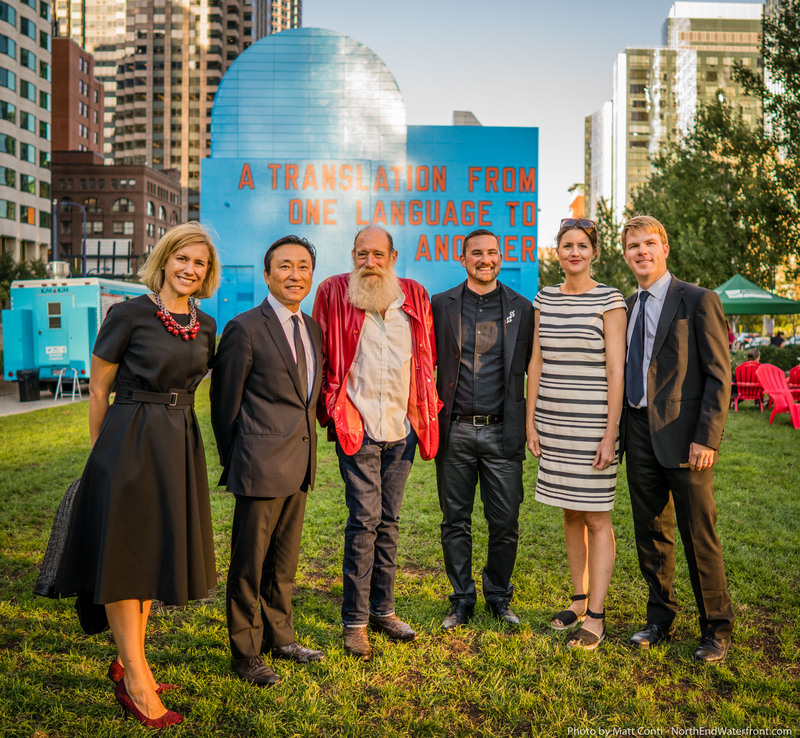 On the Rose Kennedy Greenway for the mural unveiling: (L-R) Jessie Washburne-Harris, Director at Marian Goodman gallery in NYC; Paul Ha, Director, List Visual Arts Center at MIT; artist Lawrence Weiner; Lucas Cowan, Rose Kennedy Greenway Conservancy Public Art Curator; Henriette Huldisch, Curator, List Visual Arts Center at MIT and Jesse Brackenbury, Greenway Conservancy Executive Director. The latest mural replaces Shinque Smith’s Seven Moon Junction that was created in cooperation with the Museum of Fine Arts. It followed those by Brazilian artists Oz Gemeos and Matthew Richie’s Remanence, both partnerships with the Institute of Contemporary Art. The latest mural will be on display until next September. Tell us what you think of the new mural in our poll below.